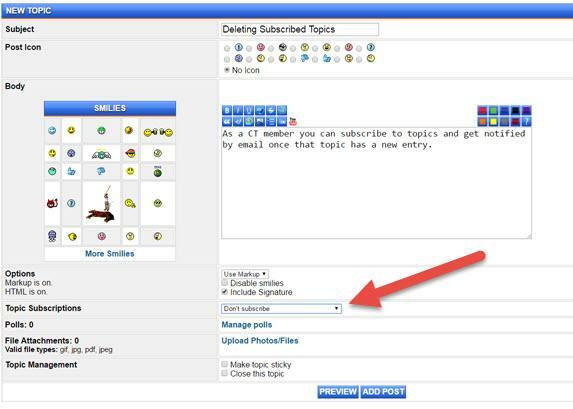 As a CT member you can subscribe to topics and get notified by email once that topic has a new entry. This is a great way to stay involved in a subject that interests you. Normal users can subscribe up to 10 posts, Supporting Members can subscribe up to 50 posts. Once you reach that limit you will no longer be able to add more unless you delete some. Here are screen shots of how you would subscribe to topics and also how you would deleted them. One method of subscribing at the time of your post. The option is located at the bottom of your post. Another method is to subscribe at the bottom of the thread itself if you have never posted in the thread. Execution time: 0.137 seconds. Total Queries: 16 Zlib Compression is on.